CustomMenu lets you build your own global menu containing your favorite apps, files, and folders. Once created, you can easily open apps and files or browse folders and access their contents from any app with your CustomMenu. An OS X Dock usually contains running apps, often used apps, files, folders, and minimized windows. 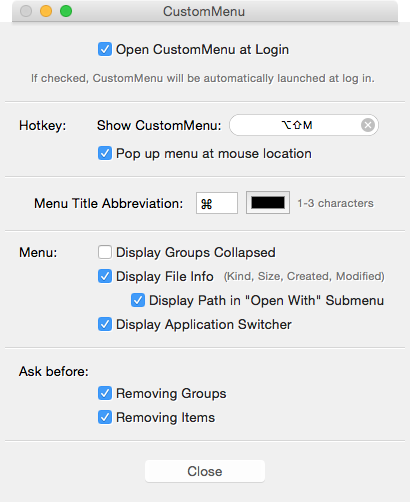 By adding items to CustomMenu instead to your Dock, you can keep your Dock clean and clear but still have them instantly and systemwide accessible. 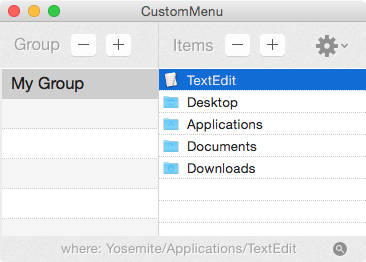 The classic CustomMenu is still around, but for users running OS X El Capitan (10.11) or later, there's a newer version available here: CustomMenu 3. The benefit of using CustomMenu is obvious. As you add apps and utilities to the Dock or Menubar, things get cluttered, visually. With CustomMenu you won’t even need the Dock. One click navigates anywhere. Well done. Fast. Inexpensive. 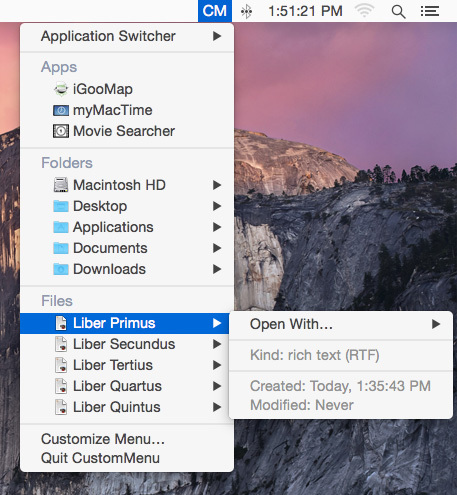 Instead of digging into the Finder, from whichever app you’re using at the moment, all your apps and files and folders are merely a click away. CustomMenu is well done, elegant, should be included in OS X.
I look forward to future updates to CustomMenu, but even now, it’s a great utility for quickly accessing your favorite apps, files, and folders from within any app—even when you’re using an app in full-screen mode.